In life, you can never be sure what will happen or how other people will treat you. Learning the practice of self-defense helps give you a sense of power and safety in a cruel, chaotic world. However, physically being able to fight off a potential attacker is not the only reason self-defense training matters for kids. There are many benefits and positive outcomes of enrolling your child in a local self-defense or martial arts training club. At Infinity Martial Fitness, we are passionate about using martial arts training to help the children of our community — Lebanon, Hanover, Upper Valley — to build confidence and discipline with our kids’ martial arts programs. Follow along in today’s post as we review just a few of these benefits. 1. It empowers kids to advocate for themselves. 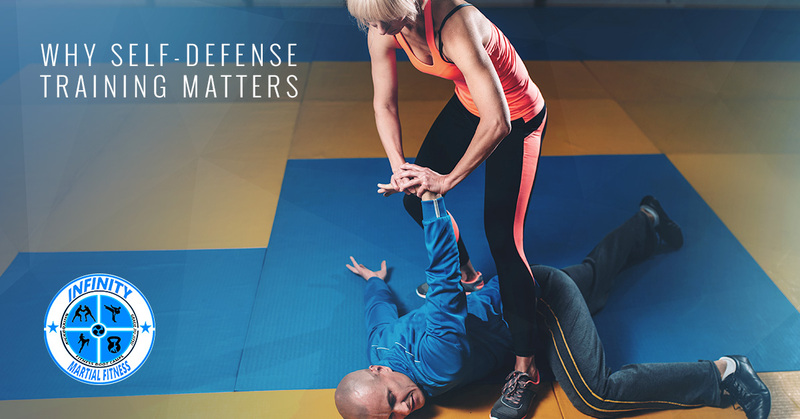 At the root of all self-defense training is the underlying message that you are worthy of being safe and that your life is worth protecting. This powerful message helps to build a sense of self-respect and a realization that you matter, you are important, and you are worthy. For children to learn this at a young age helps them to better advocate for themselves in all aspects of life. While many shy children will deny basic comforts in order to not inconvenience others, a child who has the self-respect that self-defense instills, will not hesitate to ensure that their needs are met. 2. It helps fight bullying. When some people think of self-defense, they imagine the physical ability to fight off an attacker or return a punch that is fired. However, self-defense is a complete awareness of your surroundings and the ability to stand up for yourself and others. Self-defense training helps to promote bystander intervention when another person is being bullied as well as teaches children that they should not bully others. Martial art, specifically, teaches the discipline and moral responsibility to never use the skills to attack another person, rather protect oneself and others. 3. It teaches discipline and responsibility. Martial arts self-defense training is founded on intense discipline. It is not the art of returning punches, but the art of discipline and responsibility for personal reactions. The discipline of mind and body, the discipline of muscle control and movement. Martial arts requires the practitioner to engage in the movement over and over and to anticipate the movements of the enemy. There is discipline in martial arts dress, etiquette, and behavior. This discipline and responsibility flow over into other aspects of life — academics, chore completion, and goal attainment. Confidence is something that cannot be taught but must be achieved and instilled. Children are particularly vulnerable to influence and reactive to what they are told and how others treat them. Throughout life, there are a lot of normal, awkward moments and phases of life that can damage the self-confidence of children. Learning self-defense, and all the skills and discipline that go along with it, prove to a child what they are capable of and gives them the courage to hold their heads a little bit higher. 5. It improves physical abilities. Learning the art of self-defense or martial arts is a physically intensive practice. Body control movements, self-defense maneuvers, and evasion tactics require significant strength and repetition. This training and movements build strength, flexibility, and endurance which improves the overall physical condition of the practitioner. These skills and physical endurance make other physical feats much easier to achieve. 6. It encourages goal setting and achievement. The practice of martial arts includes the attainment of different levels as identified by various colors of belts. These belts are not simply indicative of the amount of time a person has been training, they are earned by achieving different goals. This quest to learn more and continue to improve to reach the next level translates into life outside the dojo. Children who practice martial arts tend to be more successful in school and life because the drive to achieve goals is relentless. Practicing martial arts for self-defense is a powerful way for anyone to gain empowerment and inner peace. When children practice martial arts, there are so many healthy and positive benefits to their emotional and physical development. The skills they learn, aside from the kicks and movements, are invaluable and lifelong. If you want to give your child an opportunity to blossom, enroll them in a local martial arts self-defense program. At Infinity Martial Fitness, we offer a variety of self-defense and martial arts classes for kids and adults alike. Check out our programs online or stop by to find out more. Enroll your children — and yourself — today!